The first mechanistic picture is presented of the process by which crystals develop exotic morphologies previously attributed to “mesocrystals.” The canonical mesocrystal of calcite grown in polystyrene sulfonate solution forms through completely classical processes of step advancement on faceted crystal surfaces, putting to rest the notion that a typical mesocrystal morphology is evidence for a growth pathway via particle assembly. Credit: Paul J. M. Smeets, Kang Rae Cho, Nico A. J. M. Sommerdijk and James J. De Yoreo: A Mesocrystal-Like Morphology Formed by Classical Polymer-Mediated Crystal Growth. Advanced Functional Materials. 2017. 27. 1701658. Copyright Wiley-VCH Verlag GmbH & Co. KGaA. Reproduced with permission. Crystals ─ which are a ubiquitous form of matter in the environment, within living organisms, and throughout technology ─ are created along many pathways. Some crystals grow from a solution by a so-called “classical” mechanism in which individual atoms, ions or molecules (the crystals’ building blocks) are added to the crystal surface one at a time. Others grow through an assembly of more complex entities such as molecular clusters or preformed nanoparticles. When biological macromolecules like proteins or polysaccharides are added to the solution mix, the formation pathway can be drastically altered. If the added macromolecules mediate nanoparticle interactions in a way that causes them to assemble with crystallographic alignment, the result is a composite structure often referred to as a “mesocrystal”. Mesocrystals behave in many ways like perfect single crystals but have complex forms that differ greatly from the simple geometric shapes usually associated with single crystals. Moreover, they exhibit rough surfaces that appear to record the continual addition of nanoparticles during their growth. 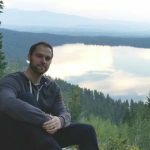 New research now blurs the line that separates mesocrystals from their simpler cousins, by showing that the complex forms commonly attributed to nanoparticle assembly can also result from classical growth via single ion additions under the influence of macromolecular additives that interfere with the process by blocking the sites where attachment is most easily accomplished. Starting with solutions of CaCO3, which is amongst the most common biologically produced minerals, researchers introduced the highly charged polymer polystyrene sulfonate (PSS), which provides a sulfate-rich surrogate for the sulfated polysaccharides found in many marine organisms that mineralize CaCO3. When crystals of calcite, the most common form of CaCO3, were added to the solution, they grew into the exotic structures previously attributed to mesocrystal formation. The researchers then observed the growth of calcite crystals from these solutions using atomic force microscopy (AFM), which provides a topographic map of crystal surfaces with resolution down to the level of atomic dimensions. As in previous studies, in PSS-free solutions, they found that the crystals grew by movement of single-atomic height steps across the surface as ions from solution attached to the step edges, which were aligned along specific crystallographic directions of the crystal lattice. However, the introduction of PSS led to the development of new step directions and the poisoning of sites along the old steps, where the attachment of the calcium or carbonate ions was inhibited or prevented. 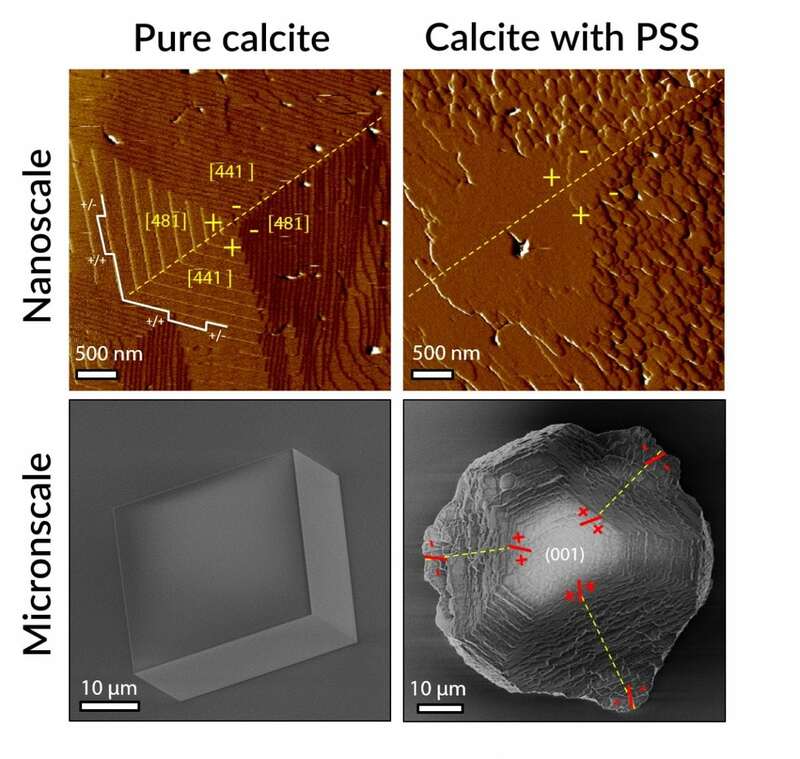 The pinning of the steps by the PSS generated extreme roughening of the surface and broadening of the usually sharp crystal edges into pseudo-facets, while the new step directions caused the appearance of other pseudo-facets not present on calcite crystals in PSS-free solution. Growth by addition of nanoparticles was never observed. Hence, the researchers concluded that the final morphology arose through completely classical growth mechanisms. These findings show how nanoscale dynamical features that arise from the interference of highly charged polymeric additives with the process of attaching of ions, atoms or molecules to atomic sites on a crystal, can translate into complex macroscopic forms. The results serve as a cautionary tale to those who would use crystal morphology as a unique signature of the underlying growth process. Moreover, given the complex chemical environments present in natural settings, impurity-controlled classical pathways to complex crystal forms may well be the rule rather than the exception. The study, A Mesocrystal-Like Morphology Formed by Classical Polymer-Mediated Crystal Growth was recently published in the journal Advanced Functional Materials. This work was led by Paul Smeets, Nico Sommerdijk, and James De Yoreo from Northwestern University, Eindhoven University of Technology, and the Pacific Northwest National Laboratory, respectively. Paul Smeets is a PostDoc at the Department of Materials Science and Engineering, Northwestern University. Nico Sommerdijk is a Full Professor, Department of Chemical Engineering and Chemistry, Materials and interface Chemistry, Eindhoven University of Technology. Previous Post« Previous Jupiter Rings: Does Jupiter Have Rings?